You eat a low-fat, low cholesterol diet. You get plenty of exercise and keep your weight within a healthy range, yet still can’t seem to lower cholesterol. It may just be that your body is pre-programmed to a certain cholesterol level, and even the best efforts can make it difficult to go any lower. There is significant evidence indicating that cholesterol levels are an inherited factor. For this group of people predisposed to high cholesterol, it is going to take some extra work, but lower cholesterol readings are possible. Studies conducted by the Lawrence Berkeley National Laboratory in California compared the cholesterol levels in identical twin males who have the same genetic make up. Twenty eight sets of twins were studied by giving one twin from each pairing a low-fat, low cholesterol diet and the other ate as he pleased. One was a disciplined runner while the other got little or no exercise. While the twins who ate better and moved more did have lower cholesterol, it was not as low as it would have been, had they not been genetically inclined toward higher cholesterol levels. Even statin drugs such as Lipitor or Zocor along with their side effects can normally lower LDL cholesterol but don’t always work because the person is genetically programmed to a higher cholesterol level. It is these findings that are paving the way for drug manufacturers to come up with a gene-based drug to battle cholesterol. The most effective way to prevent heart disease and lower cholesterol is through a proper diet rich in green leafy vegetables, whole grains and specific nutrients known to lower cholesterol. 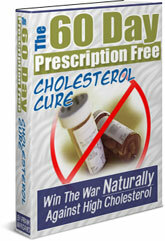 The proven method is outlined in an all natural approach to lowering cholesterol. It is called The 60 Day Prescription Free Cholesterol Cure.